Top local runner Lamont Marshall has broken yet another Bermuda record – his third in the last few weeks. 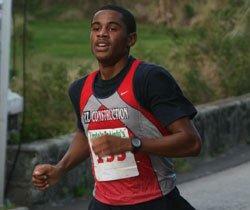 Last night [Apr.28] Mr Marshall broke the Bermuda record in the 10000 meters at the Penn Relays held in Philadelphia. His time was 30:20 which is nine seconds faster than the old mark of 30:29 which was set by Kavin Smith. The race actually started at 12:15am [1:15am Bermuda time] due to delays. He placed seventh overall in the Olympic Development Race, which was won by Brian Harvey in a time of 29:39. Mr Marshall now holds three Bermuda middle distance records all set within the past six weeks; the 3000, 5000 and 10000 meters. On April 8th, he broke the 5000 meter record while competing North Carolina. Two weeks before he competed in the ‘49er Classic’, winning the North Carolina race and shattering the Bermuda 3000 meter record in the process. Excellent – Job well done. I admire Mr. Marshall’s disicpline, passion and dedication. Great job – keep it up. Keep up the good work man! You are rep’in Bermuda well!